20 posts categorized "my music"
I love you Lawrance!! I thank God daily for making you my husband. What a privilege to walk life next to you, with you. What great joy is mine . . . all because God is kind and gave me to you and you to me. 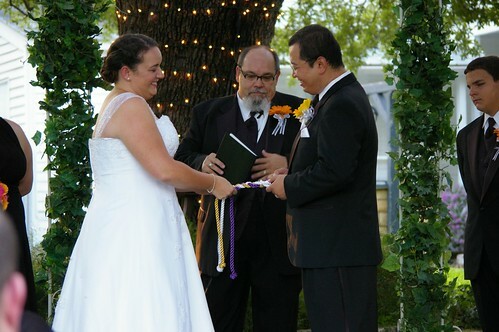 In addition to the sand ceremony, we also choose to do a "cord of three strands ceremony" too. I have no idea how I found this, but I do know I found it while surfing for ceremony ideas, and that I ended up here, which is a site that explains the idea and sells the cords. This was probably the last thing we added to the ceremony. Lawrance loved the idea. It was also something that we could easily do in both the American and Taiwanese ceremony, and something we could frame and keep for a long time. I braided the three cords while Lawrance held them, and then he tied the end of the braid together with a small wire when I was done braiding. Ecclesiastes 4:12 illustrates the importance of Christian companionship. Two Christians that are bound together in Christ are stronger than the individuals themselves. We believe that Christian marriage is about more than the union of one man and one woman. The Bible teaches us that God performs a miracle in our marriage, uniting us together in a covenant relationship with Him as one. The Cord of Three Strands is a symbol of that sacred union created today. The gold strand symbolizes that we have invited our Lord Jesus Christ to the position of authority in our marriage relationship. The purple strand represents the groom. It illustrates the majesty of God as head over the husband. As Lawrance submits himself to the Lord, the Lord in turn will hold the marriage together through him. The white strand represents the bride. It illustrates the purity of the bride of Christ. As we receive Jesus Christ as our personal Savior and Lord, we are cleansed through Christ. Lawrance and Amanda have also chosen to braid three strands together into a single cord. A "threefold cord" is a symbol of union. Where two are closely joined in love and fellowship, Christ will, by his Spirit, come to them, creating a threefold cord. In braiding these three strands together, Lawrance and Amanda are demonstrating that their marriage is more than a joining of two lives together. It is a unity with God as well. They are choosing to allow God to be at the center of their marriage, woven into every aspect of it. While we tied the cords, we had "Savior Like a Shepherd Lead Us" playing. We used 4Him's Hymns: A Place of Worship CD. This song was my mom's suggestion--she always thought this was a great hymn to use at a wedding, and we agreed. We thought about using it for the recessional, but it just wasn't "peppy" enough. However, I do love the words of the song, and I am glad we found a place for some of it to be heard during our wedding. In Thy pleasant pastures feed us, for our use Thy folds prepare. Blessèd Jesus, blessèd Jesus! Thou hast bought us, Thine we are. Keep Thy flock, from sin defend us, seek us when we go astray. Blessèd Jesus, blessèd Jesus! Hear, O hear us when we pray. Blessèd Jesus, blessed Jesus! Hear, O hear us when we pray. Thou hast mercy to relieve us, grace to cleanse and power to free. Blessèd Jesus, blessèd Jesus! We will early turn to Thee. Blessèd Lord and only Savior, with Thy love our bosoms fill. Blessèd Jesus, blessèd Jesus! Thou hast loved us, love us still. My neighbor friends were watching a new music video this weekend. As I watched it along side them I loved how very much it captured what is TAIWAN. I asked my husband (how fun it is to say that!!) to help me find the video online. And he did. As we watched it together he exclaimed several times how very much this video was "Taiwan" too. If you are remotely interested in Taiwan, take a look at this two minute music video that shows scenes that are just pure Taiwanese. Even if you don't know Chinese I think you can still understand the story and enjoy the views of Taiwan shown in the video. The song is entitled "Fragrant Rice" (稻香) . . . and basically says "if you are feeling like a failure and don't know what to do follow the smell of the rice back to your roots and find your family who will love you and support you no matter what. Come back home and remember the simplicity of where you came from." The song is by Jay Chou (周杰倫), a rather well known Taiwanese musician. Last year, I discovered one of my students had been singing on TV. But, because I didn't have cable, I only watched a few of the videos of her on YouTube. I told her I had seen her singing and was impressed. It was then that I found that what I had watched was small potatoes . . . . and that she had sung at other times on other shows too--as recently as just that past weekend. But, she didn't tell me exactly what or brag or go into details. So, fast forward to this summer when I moved to Tainan and a typhoon blew through at the same time. As I sat in my friend's apartment locked safely inside and utterly exhausted, I flipped through the channels . . . and I SAW HER ON TV!!! I was shocked. I mentioned it to my friend and found out that my student entered a "Taiwanese Idol" show on a major TV network. There are currently three different "Taiwanese idol" shows on prime time right now here in Taiwan. My student is on the one called 星光大道 in Chinese. They call it "Million Star" in English but a better translation of the show's name would be "Path to Stardom" or "Avenue of the Stars." Well, they have it down to the top five and tonight the show is live as they determine the ranking of the top five and declare a winner. Rachel has consistently received high scores throughout the show. And currently is in first place from the last 3 weeks of "top 6" competitions when they started adding the scores together for the top 6 and not just kicking off the low achievers! So, no doubt that tonight I will be watching this show and cheering on my former student!!! Kathryn Scott, from Northern Ireland, is one of my favorite worship leader. Her CD Satisfy was with me through some really rough patches. I am not certain because I've not taken the time to look around more, but it seems that Integrity is streaming lots of their CDs. So, go ahead and take a browse to find a new worship leader or old favorite! I've listened to it over and over. What a great addition to my "Trusting God Playlist" (which started after reading about Carolyn McCulley's list)! You can listen to a minute long clip of the song online. To give credit where credit is due: the original was written in German by Samuel Rodigast in 1676. Catherine Winkworth translated it to English in 1863. Then, Mark Altrogge updated the English for the CD and wrote new music for the song. On March 19 of this year, one of my students (whose English name is Rachel) appeared on TV to sing a song as part of a contest show. You can watch her in the following youtube video and see a little of Taiwan TV culture at the same time. :) She even gives an acapella encore. And the audience even claimes to get "chicken skin" or as we say in English "goose bumps." She has an awesome singing voice in my unbiased opinion. This is a short video or me playing my ErHu at the park this past Sunday. The pastor's wife is singing in Taiwanese while I play. Beth and Ashely at Onward & Upward posted a fun little musical meme to add a little music to the party (my 1st party post). What a great idea! I love music and totally agree with them about a party is no party if there is no music. HOWEVER! I could not choose my FAVORITE song for a bunch genres any more than you could tell me which child of yours is your favorite. You just don't. You just can't. AND . . . all those 80's songs that were on the radio when I was growing up--I never heard. All those 90's songs that were on the radio when I was in high school--again, never heard. Let me tell you why . . . When I was a kid, I had all 6 Psalty the Singing Songbook tapes that were out at that time. I listened to one side of one tape each night to fall asleep (which started a music listening habit that didn't stop till I got to college and had roommates). Although I loved all 6 tapes, Kid's Praise 4 about being a servant and Kid's Praise 5 about a camping trip (casting our cares on the Lord) were played most often. I LOVED Psalty. These cassettes introduced me to worship and faith and showed me that praising God is a very real, everyday in everyway kind of thing. I remember my parents listening to Keith Green and the Maranatha! Praise Team . . . these too had a powerful impact on my love of music and heart of worship. Psalty, Keith Green, and the Maranatha! Songs hold an incredibly special, tender place in my heart. When I was in sixth grade, I woke up on Valentine's Day with a terrible case of chicken pox. It was a terrible catastrophe to me. As a result, my mom and dad both sympathized and spoiled me. I clearly remember my dad buying me my very own bottle of Diet Pepsi--a glass bottle that was my very own to drink all by myself. (By the way, I kept that bottle till 2003, which I decopoged with stickers and filled with pennies). And, one day during my three weeks home from school, mom brought me a walking yellow helium doctor balloon and two cassette tapes--Michael W. Smith's The Big Picture and Twila Paris' For Every Heart. Little did I know this was part of her great plan to help me "grow up" (not the chicken pox--the tapes). She had decided that I needed to "move past" Psalty. When we moved at the end of that year, she helped me to finally release my Psalty tapes into the world to bless someone else. I spent my babysitting money and allowances on building a CD collection of contempary Christian pop music . . . in addition to Twila and Michael, I bought CDs from muscians like Steven Curtis Chapman, Point of Grace, Amy Grant, 4Him, and NewSong. I also had a several various praise and worship CDs. I had built quite a collection of CDs by the time I entered college. And it had become an addiction of sorts . . . I needed to buy new music. My first sememster at college, I realized I was addicted to buying music. Really--I was convicted. So, in 1997, I didn't buy any new music at all. I "fasted" from purchasing CDs (I'm not even sure my parents knew about this; at the time I only told my roommate LeAnn about it). After that, I didn't really enjoy comtempary Christian music anymore. I listened to a lot of Dennis Jerrinagin, Don Moen, and the Passion worship leaders and bands. I longed for meaning and substance. I also enjoy a variety of sounds and styles now too. In my post-college years, for the first time in my life, I started listening to "non-Christian music." I enjoy a little jazz or country now and then. I look for and enjoy many indie artists; I like listening to sounds that aren't quite so "polished." I also enjoy songs with meaningful lyrics--I like it when the singer is also the song writer. I also prefer bands over solo artists. Oh, and I also listen to music in Chinese. My itunes and mini ipod most frequently play in "random shuffle" mode, but some of my current most played songs include songs by (in no particular order). . . I could type another 20 or even another 40 groups/singers 'cuz, well, I LOVE music. :) Nope . . . there is no way I could ever pick a favorite song or group. How about you? Know a group I should try out? Is music an important part of your life? Why or why not? This Sunday, December 17th, Hokkien Harvest missionaries will be joining Peter and Mary's housechurch to worship Jesus in a public park for a Christmas celebration. I invite you to join me in praying for this time. Jesus is the King, born for you and me. Jesus, we remember it's your birthday! --it connected lighting the Christmas tree to worship of the King. And, I reckon we like it as adults because of all of the above, plus the fact that it invokes warm memories of our childhood. Have you ever heard it? I would suggest you go listen to it on itunes (or your preferred online music resource)--one version of the song is only 48 seconds, listening to the free 30 second sample would let you listen to almost the entire song. :) Of course, you might not "lub-lub" it as much as me and Sarah, and that's ok.
Christmas has a lot to do with expectation and waiting. And, I like the idea of waiting for some of the joys Christmas-time brings--expecting them. So, I have to FORCE myself to wait till the day after Thanksgiving to start listening to Christmas music. Then for 24-7 for the next month, it is non-stop Christmas music. It is something I long for! It is something I love!! Christmas music is full of memories. Listening to certain songs sung by certain artists invokes special feelings that only come out once a year. The songs bring back great memories of childhood--of innocence, peace, delight, hope, expectation, of being with family and friends. But, more than being full of warm-fuzzy memories, I like Christmas music because it is worshipful and joyful. It is a celebration. What we have been waiting for--a Savior--has come! It is a time to be rejoice! Strike the harp! Ring the bells! Light the tree! Let's go! Worship the King!!! In addition to bringing back memories and allowing me to worship the Prince of Peace, Christmas music also lets me witness to my students. I can teach them Christmas carols and talk about what they mean. We talk about the Christmas story. It is great!! What a blessing to have this tool to use for sharing Jesus! I remember the first time--oh about seven years ago--when I was in a Taiwanese department store and I heard the Good News through Chirstmas songs being proclaimed over the storewide speaker system. It floored me first of all that they were playing "real" Christmas music. When I recovered from that shock, I was saddened by the fact that those around me had no clue what they were listening to--it was only in English, not Mandarin. To them it was just pleasant sounding tunes. Michael Haggard, a friend who is also a tentmaking missionary here in Taiwan, blogged recently about this same phenomenon of English language Christmas music in public places--like McDonald's--here in Taiwan. This post was submitted to the Carnival of Beauty sponsored by Sallie at A Gracious Home. This week the theme is The Beauty of Christmas Music and is hosted by Susanna at Through a Glass. Join us next week for The Beauty of Salvation. I didn't expect to hear Chinese while I munched on my chicken in my parent's home, nor did I expect my reaction to hearing the Chinese: I broke down and cried. I miss Taiwan. And, at the same time, I am thankful that we really do worship the God who is greater than all other gods! 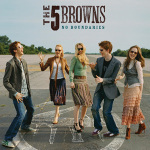 I was searching for some classical music on itunes last night, and I stumbled upon a group called "The 5 Browns." They are 5 siblings (2 brothers, 3 sisters) who are all Julliard-schooled concert pianists. You can actually watch a clip of them all playing together and listen to clips on their site.